St. Augustine Pup Crawl: A historic Pup Pub Tour with pet stops, including water and treats for your fur baby. $49 per person includes 1 glass of premium craft or local beer, wine, sangria, or soda at each stop. 904-392-7137 for reservations. Thursdays and Sundays, 5 P.M.
Pawsitively St. Augustine: On the third Saturday of each month, 11 am. This is a 2-hour (approximately 2 mile) walking tour. Hear about the history of St. Augustine, as well as some pet friendly history of America. There are fun pup stops with treats and water throughout the tour. $16 per person, 12 and under $10, fur babies are free. Fountain of Youth: You can bring your pets to the site of St. Augustine’s origin of 1565. With 15 waterfront acres to cover, you and your pup will have plenty to walk and explore. Make sure he stays leashed and you’re both sure to have a wonderful day on the grounds enjoying the amazing views of the intracoastal waterway and the possible encounters with the free roaming peacocks. Open daily 9 to 6, tickets will run you $15 per person. Parking is free. Please note that picking up after your pet is super important and highly enforced. Treaty Dog Park This ¾ acre park offers your furbaby an opportunity to cut loose and be leash-free. With fenced yards for both smaller and larger dogs, let your pup frolic and play in sunshine or cool down in the shaded areas and enjoy a fire hydrant while you take a break on the benches provided. If your pet is sociable, he may just find a fellow furry friend at one of the local watering holes provided. 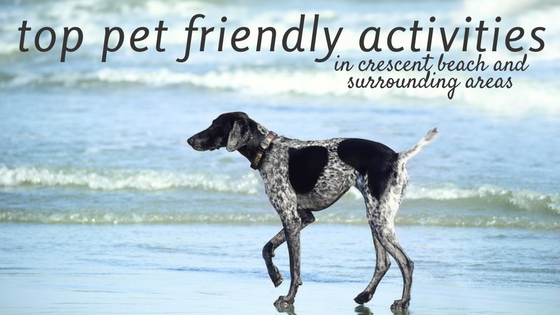 Crescent Beach: Less crowded than neighboring beaches, Crescent beach is certainly pet friendly and offers your pup the opportunity to stretch all four legs while prancing in the surf and sand (just as long as your leash will allow). Swimming, sand frolicking and general marine life investigating are all popular activities along this stretch of pet friendly coastline. Spending your day breathing in the salt air and enjoying the sand between all twenty toes, will make for some memorable beach moments and most likely a tuckered pup. Chow Time: When it’s time for dinner, there are several pet friendly eateries in the area. We recommend trying La Pentola. Known for Mediterranean and Latin Fine Cuisine, we’re sure you’ll love whatever Chef Talavera prepares for you. If you’re seeking something a bit more casual, try parking your paws at the Florida Cracker Cafe’. We love sinking our canines into their Aioli Tuna Steak. Conveniently located right next door to us is another one of our favorites: Paula’s Beachside Grill. You and your best friend can enjoy a beverage or a burger by the glow of the tiki torches on the patio. If you are in the mood for a stroll down St. George street, try yet another pup favorite at The Bull and Crown Publick House. A fabulous place to take a break under the shade of an umbrella, have a bite to eat and quench your thirst. They are always quick to offer a water bowl for your parched companion as well. Dog and Pony Show: After a day of experiencing downtown St. Augustine, you’ll be the talk of the town if you take your furry friend for a ride in one of the horse drawn carriages. You can inquire along the bayfront, where the horses are happy to trot you down the brick lined streets. While you experience our nation’s original version of horsepower, you’ll be waved to and smiled at, by all friendly folks you and your pup happen to pass. It’s a truly memorable way to experience the history and charm of our fine city. Want to take your pet on a trolley tour of historic St. Augustine? Ripley’s Red Train Trolley Tours allow pets 15 lbs and under as well as certified service animals to join the fun of riding the trolley through the historic district. The tours inform riders of the history of the area as well as fun things to do and see. Whether you make a day of tours, or find time to frolic in the waves, we’re sure your stay in Crescent Beach will leave your tail wagging for more. When it’s time to turn in for the evening, we will be ready and waiting to welcome you home to Beacher’s Lodge and your pet friendly condo! In the meantime, happy trails…of paw prints!